Nick has had an active trial and appellate practice in both Kentucky and Indiana since joining PPOA in 2007. 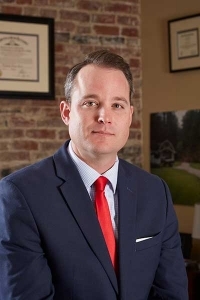 His practice is primarily focused in the areas of medical malpractice defense, professional liability defense, toxic torts, premises liability defense and products liability defense. Nick has achieved significant success as a trial attorney, having been trial counsel in a number of cases (see representative cases below). He also has successfully defended numerous healthcare providers before the Medical Review Panel in Indiana. Nick has been counsel of record on appeal before all Kentucky and Indiana state appeals courts, as well as before the U.S. Court of Appeals for the Sixth Circuit. He has presented oral arguments before the Court of Appeals of Kentucky and the U.S. Court of Appeals for the Sixth Circuit. Nick was born in Louisville, Kentucky, and raised in Danville, Kentucky. In 2004, he graduated from Colorado College with a Bachelor of Arts degree in Political Science and Economics, with a Minor in American History. He obtained his Juris Doctor degree from the University of Kentucky College of Law in 2007. While in law school, Nick was a member of the Kentucky Law Journal and served as Notes Editor. He was also a member of the Moot Court Board and the National Moot Court Team. Nick enjoys outdoor adventures with his wife and young son, collecting vinyl records, and playing golf and softball. Nick is a member of the Board of the Red River Gorge Climbers’ Coalition. He is also involved with First Tee of Louisville, Relay for Life, and the Access Fund. Trial counsel defending a medical malpractice action against a chiropractic doctor. The Plaintiff claimed that the chiropractor failed to perform proper diagnostic testing prior to initiating treatment, failed to obtain adequate informed consent, and that the chiropractor used excessive force during chiropractic manipulation resulting in a stroke following a dissection of Plaintiff’s vertebral artery. As a result of the alleged negligence, Plaintiff claimed she now suffers from permanent motor/balance issues, slurred speech, involuntary movements and memory loss. Plaintiff, age 36, is now unable to work. Plaintiff sought over two million dollars in damages. After seven days of evidence, including four experts on behalf of the plaintiffs, a Woodford County, Kentucky, jury returned a unanimous defense verdict in less than twenty minutes. Trial counsel defending a medical malpractice action against a podiatrist. The Plaintiff claimed that the physician failed to timely and appropriately address a surgical complication with a return to surgery resulting in multiple surgeries and loss of the plaintiff’s extensor tendon. Plaintiff, age 40, is now limited in her ability to walk and otherwise perform everyday activities. Plaintiff sought over one million dollars in damages. A Boone County, Kentucky, jury returned a unanimous defense verdict after brief deliberations. Trial counsel defending a trucking company in Webster County, Kentucky, which was accused of causing a multi-vehicle accident on the Pennyrile Parkway resulting in multiple personal injuries and significant property damage. Nick successfully proved that his client was not at fault and obtained a unanimous verdict. Nick also recovered 100% of the property damage sustained by his client in the accident. Trial counsel defending a governmental housing authority in Louisville, Kentucky, against claims that a resident suffered severe physical injury after years of alleged mold exposure in her public housing apartment. Plaintiff claimed that despite complaining of mold in her apartment for over 7 years, the housing authority failed to properly remediate the hazard. Plaintiff’s alleged injuries included respiratory, cardiac, and neurocognitive issues. Plaintiff initially sought over $1.8 million in damages, including punitive damages, but after pre-trial motions excluded a number of Plaintiff’s claims, Plaintiff’s demand to the jury was $1.06 million. At trial, the defense took great issue with Plaintiff’s claims of injury and causation. While it appeared that mold may have been present in the tenant’s apartment, mold is commonplace in many environments. Furthermore, upon first notice of the possible presence of mold, the housing authority staff immediately addressed the complaint. With regard to the physical effects of mold exposure on the tenant, plaintiff relied on two physicians who discounted or ignored her health history, including chronic morbid obesity. These weaknesses were highlighted on cross-examination. The jury returned a verdict for the housing authority and plaintiff took nothing. Trial counsel defending a legal malpractice action arising from a commercial real estate transaction. The Plaintiff was an LLC attempting to sell an office park. The LLC alleged that the attorney negligently failed to advise the LLC that it could not comply with a critical provision contained in a proposed $6.25 million-dollar contract for the sale of the property. The LLC contended that the lawyer actually admitted in an email sent to the LLC that he had failed to even notice the provision when he reviewed the contract. The Plaintiff sought recovery of $1.1 million dollars in damages it claimed resulted from the botched transaction. After approximately 45 minutes of deliberations, a Jefferson Circuit Court jury returned a verdict for our client. Trial counsel defending a medical malpractice action against a podiatric physician. The Plaintiff claimed that the physician improperly inserted a compression screw into the plaintiff’s great toe joint space as interpreted by a subsequent treating radiologist and orthopedic surgeon following CT scan. The Plaintiff also claimed a nerve injury, permanent disability and inability to return to her employment as a fork lift operator. The Plaintiff sought over $1.6 million in damages. A Jefferson County, Kentucky jury returned a unanimous defense verdict after brief deliberations.